It’s August in California, with our typical forecast for this time of year, “sunny with 100% chance of SMOKE!” Large forest fires are burning up and down the state. The smoke is inescapable. I was in the Northern Sierra near Stirling City earlier in the week. Smoky there too. Air quality is often terrible this time of year due to the wildfires. Lighting, drought, denser forests and changing fire fighting tactics have created conditions that foster massive wildfires. 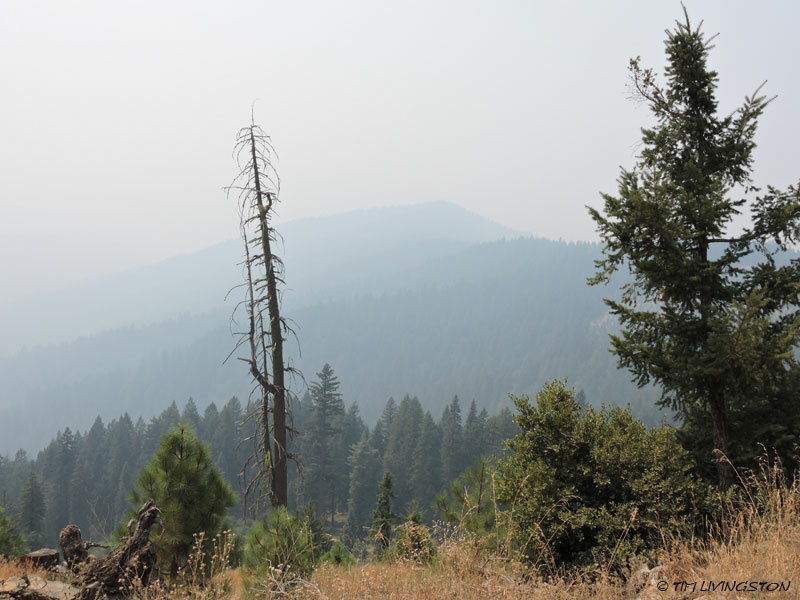 Resistance to harvesting timber on our federal forests has made it difficult to thin the National Forests. 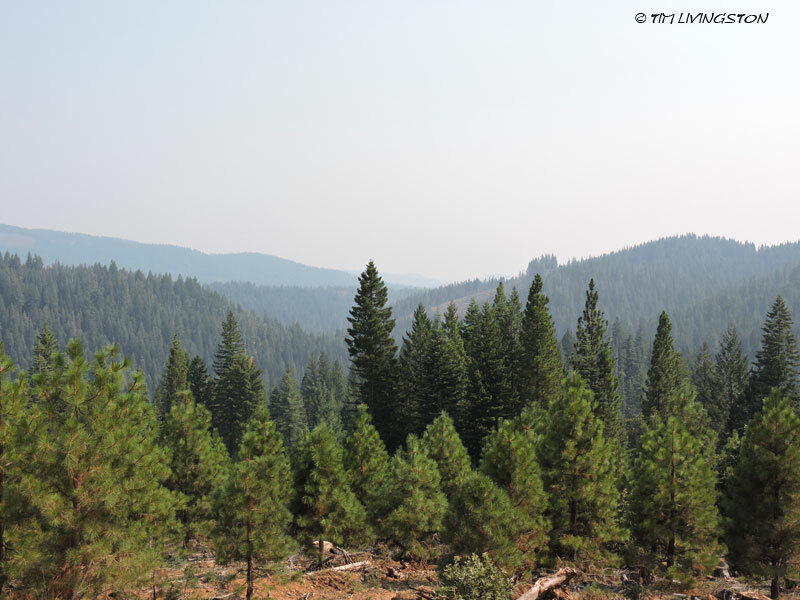 Thinning forests to reduce fuels isn’t being accomplished at the level that is needed. That in turn has caused the Forest Service to adopt a “manage the fire” approach to fire fighting. These fires burn at such higher intensity that the fire crews are forced to back way off in order to keep safe. Direct attack is nearly impossible. This makes the fires grow even bigger. 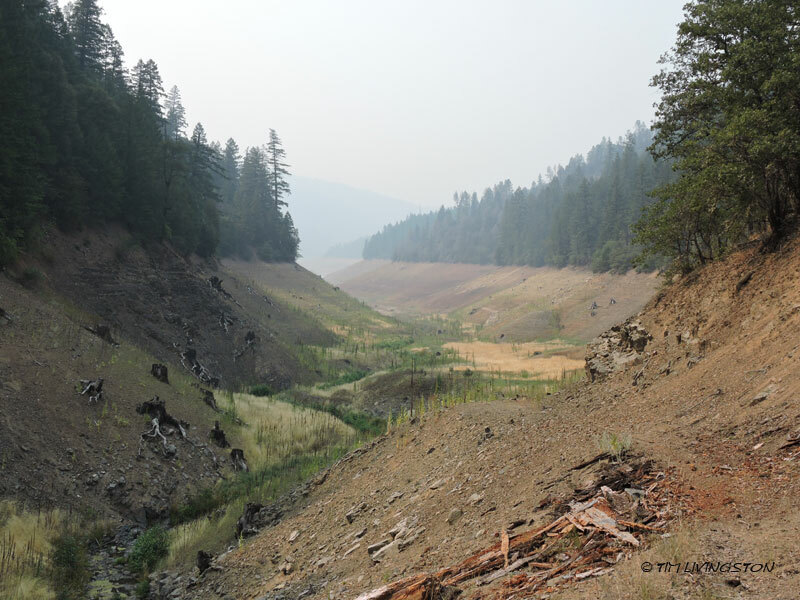 Drought is making our immediate problem much worse. Trinity Lake is somewhere back there. Thinning these forests over large tracts of land would solve several problems. It reduces the amount of fuel that feeds these huge fires. It lowers the burn intensity of the fires making them easier to fight. Fewer trees on the landscape increases the ground and surface water by reducing demand on the water table. God knows we need more water in California. Trees have less competitive stress, which reduces tree mortality from drought and insect attack. With fewer weakened trees dying there is less dry, heavy fuel created in the form of snags and downed logs. That snag is a lightening rod just waiting for a bolt. In many ways were are loving these forests to death. The forests are set up to burn because we don’t want to manage them. Too many people don’t want any trees cut down. The conventional wisdom that “leaving the forest untouched” creates a healthy ecosystem is wrong. Would you not weed your garden? 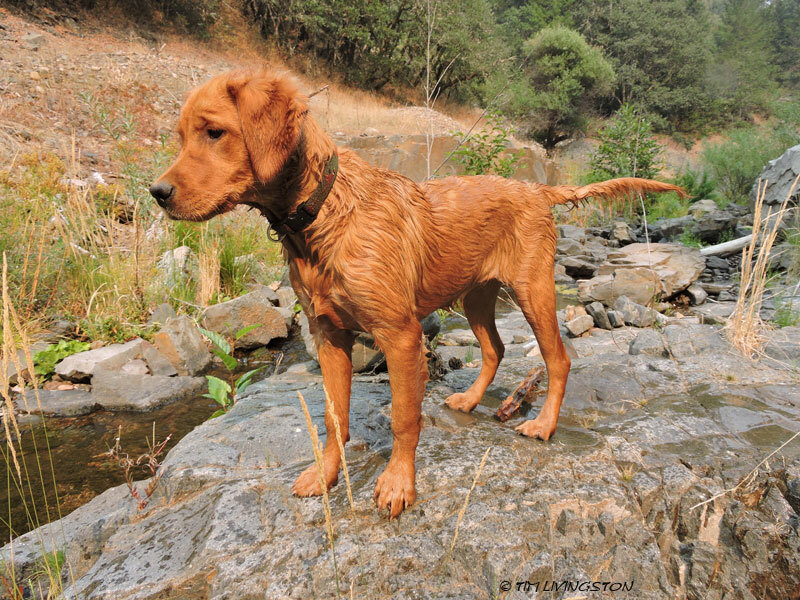 We are the stewards of these forests and it’s our responsibility to care for them. Otherwise, we are creating a forest of dead trees. 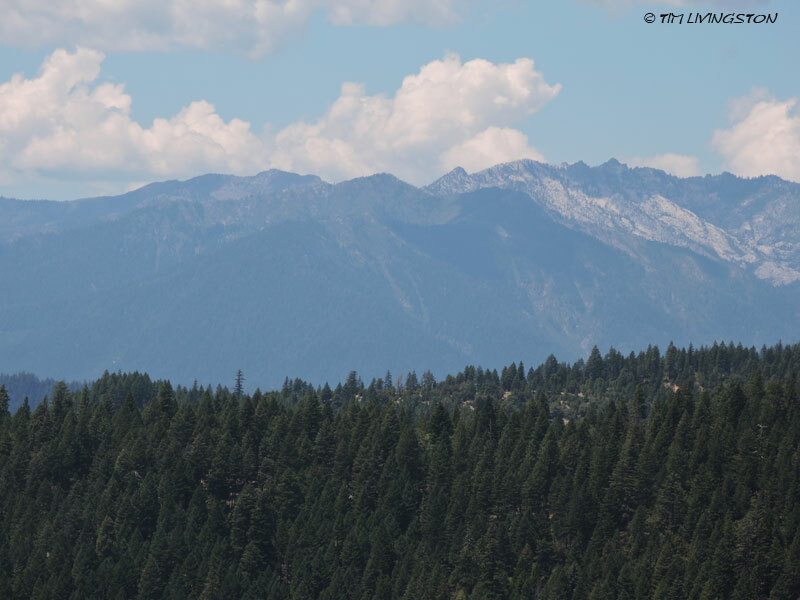 Looking toward the Trinity Alps. This is how the view is on a clear day. 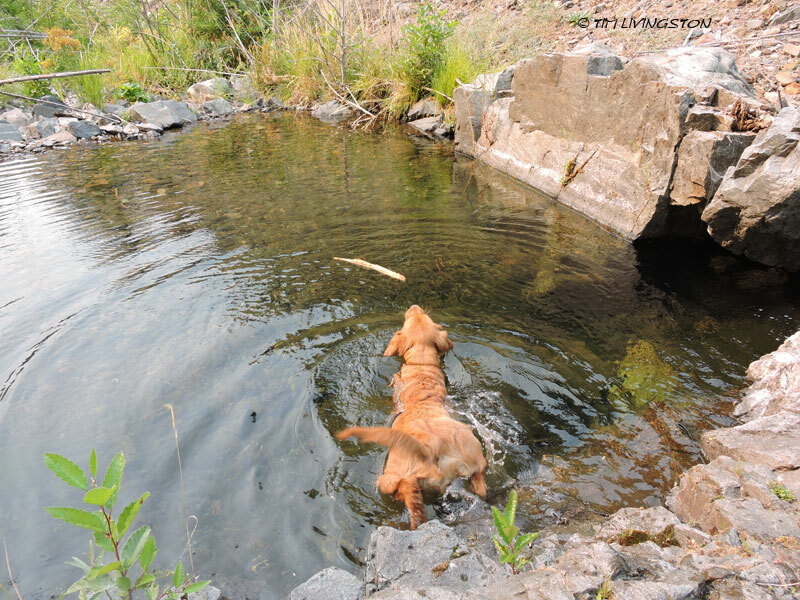 Bliss says after a smoky day in the woods there’s nothing like a dip in a cool mountain stream. A pool made for a puppy! 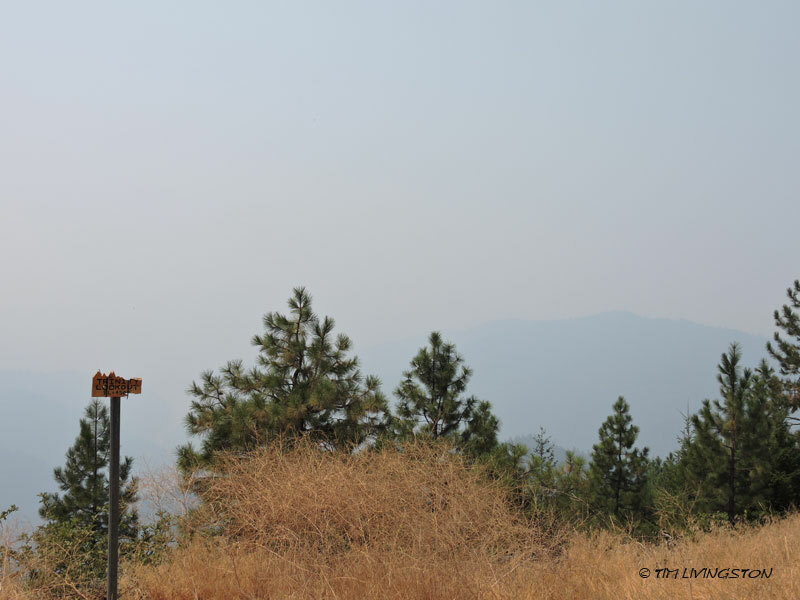 This entry was posted in Forestry, Musings, Wildfire and tagged air quality, bliss, drought, fire fighting, forestry, golden retreiver, smoke, thinning, wildfire by foresterartist. Bookmark the permalink. I’m about 20-25 miles WNW of the Rocky Fire, that’s currently holding just short of 70,000 acres and a little under half contained. From what I’ve been hearing that area hasn’t had a fire in a long time and had a lot of undergrowth built up. I think the terrain there is pretty rough though, with a lot of chaparral. 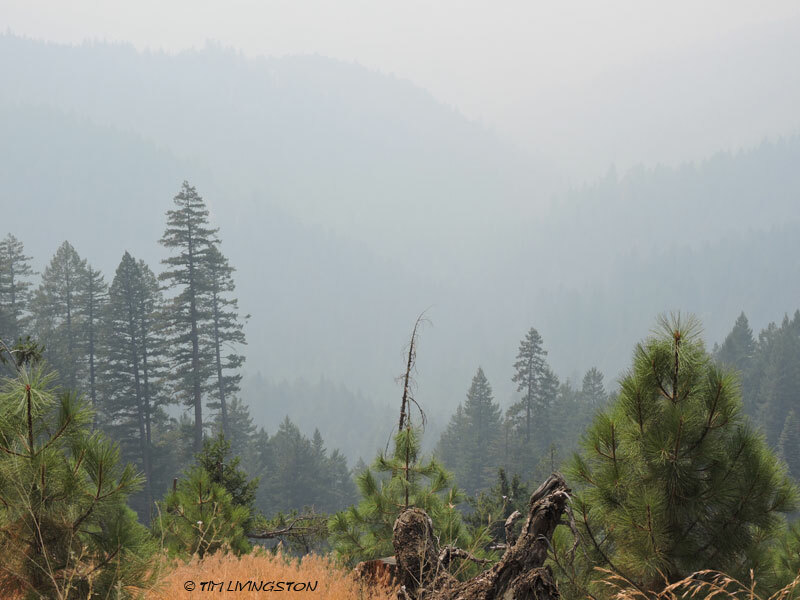 About a week ago the wind was sending the smoke my direction and it was hazy just looking down the road with little flakes of ash floating in the air. I see fire trucks from all over, even down in the LA area, driving around because their staging area is near me. Definitely, because even just looking around me on the place I rent and the neighbors’ areas we have a lot of oaks. Here and there are some big, tall oaks with wide spreading branches and generally no other oaks in a little space around them. Those are the ones the birds like to hang out in the evenings and where the larger birds like crows, hawks, and ospreys always land. Then there’s a lot of thin little oaks crowded together in patches or swathes, but none of them can grow big. I hope they get a handle on the Rocky Fire pretty soon. Fortunately, that fire is a Calfire responsibility. They are more aggressive in their approach. Your observation is spot on in regard to the tree sizes. If those smaller trees had been thinned years ago, they would have been much larger today. Totally with you on the thinning the forest philosophy. Also, every once in a while it happens that when a controlled burn is called for it somehow gets out of hand and becomes a wildfire. I don’t know what the solution is because people have come to inhabit a portion of almost all the forest areas. And Lord knows they don’t want any controlled burns near their property. We so often seem to mess up the ecosystems that we cherish. And even drought and high temps don’t help persuade many that we’re almost over the edge as far as managing our forests is concerned. I remember that in Los Angeles residents of hilly, brushy areas (that included me) were required to do brush clearance every year and although it was a nuisance and an expense I understood the need for it and did it. It was a lot less likely for the trees to roar into flames if there was nothing underneath to feed the fire. Very true Alli. That brush provide the ladder fuel to turn a fire into a crown fire. Controlling the brush is so important. Reintroducing fire into most ecosystems is so difficult because of the density of the brush and trees. You won’t see it used much around houses, it’s too risky. You can harvest excess trees and treat brush mechanically to reduce those forest fuels without the risk of fire. Many of the areas where fire has been reintroduced has been harvested first. yep, loving them to death, I totally agree, I think we will try more controlled burns here in BC. I think it’s hard when the people making the decisions live so far away from the real forest. Controlled burns can do a lot of good, but they can be tricky to use. Most of the time, some amount of mechanical preparation is necessary before lighting them off. Houses usually make burning a no go. Yeh, where houses are, fire needs to be stopped, I’m super lucky to live where there are not many houses. I wish you all the best in your smokey time, sooner or later it will rain and the smoke will clear. Thanks Annerose, hopefully it will be sooner. Ugh…sorry to hear about the wildfires and the lack of proper management. And I wish I could send you some of our rains; we have had twice as much as we normally get. Yes Teresa, send the water quick! Due to the water restrictions most people have brown lawns. California has a very extensive aqueduct system, but it’s not enough during a years long drought. This year we’re moving into an “El Nino” weather pattern, which may mean a wet fall. Fingers crossed. Oh, I was thinking of an aqueduct system for the entire country whereby the super saturated areas can send water to the places with drought…just a crazy (sci-fi-ish) dream. 🙂 I’ll cross my fingers for you guys, too! Not that far fetched when you consider the length of some oil pipelines. Good point! 🙂 Maybe one day it could happen. Be nice to be able to distribute the wealth of water. Sorry to hear this and you raise great points. I’ve always been on the traditional environmentalist side, but I’m glad for your explanation. Thank you. I hope you get some rain fast! Thank you Laura. As a forester I’ve always considered myself a professionally trained environmentalist. Even though I may not line up with “traditional environmentalist” much of the time. In my personal experience in forestry I find the issues are far more complex than many of the populist messages put out in the media. Short sound bytes can’t explore the issues in an honest manner. When you consider the messages being put out there, whether it’s from a timber company or an environmental group, there is always agenda interwoven in it. When we have clean science to base out decisions from, we will get the best results. No doubt. Thank you for your input and professional wisdom! Like California BC has been getting its fair share of wild fires this year. The smoke is indeed inescapable. Hopefully fall will bring rain and lots of it. We are on the same page Susan. Hopefully, people will realize that some trees need to be cut in order to have a healthy forest. Your closing line reminded me of the creation story and God’s response to His works. Wonder what His response would be concerning our responsibility to care for it. I would hope God looks at us as a work in progress. Reblogged this on Myblog's Blog. I hope you are getting some relief soon. You are right that both sides of the issue often have an agenda to push. Reality is much more complex than a sound bite and I wish that there could be more give and take instead of winner vs loser mentality. Something might get solved. We have had record rains in June and July here, although August has been fairly dry so far. Wish we could send you some and at least clear the air some. Bliss looks as though she has been having a great time. She sure is growing fast. Please, send that rain west! Bliss is growing like a weed. She already thinks she’s a big dog.